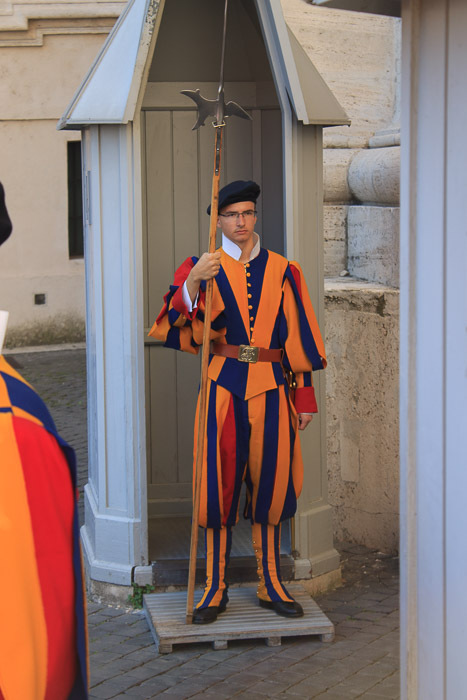 See all St. Peter's Square photos. 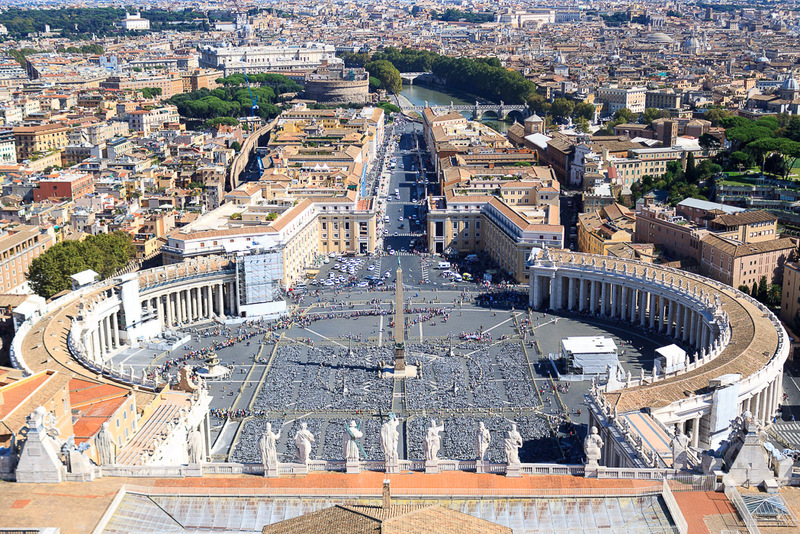 St. Peter's Square (photo above) is a huge oval-shaped piazza with a rectangular piazza behind it which leads to St. Peter's Basilica. It was all designed by Bernini. The edges of the oval part of the square is made of colonnades which consist of 284 Doric 43-foot-tall columns and 88 pilasters, of travertine marble, arranged in 4 rows, all topped by a curved ceiling. 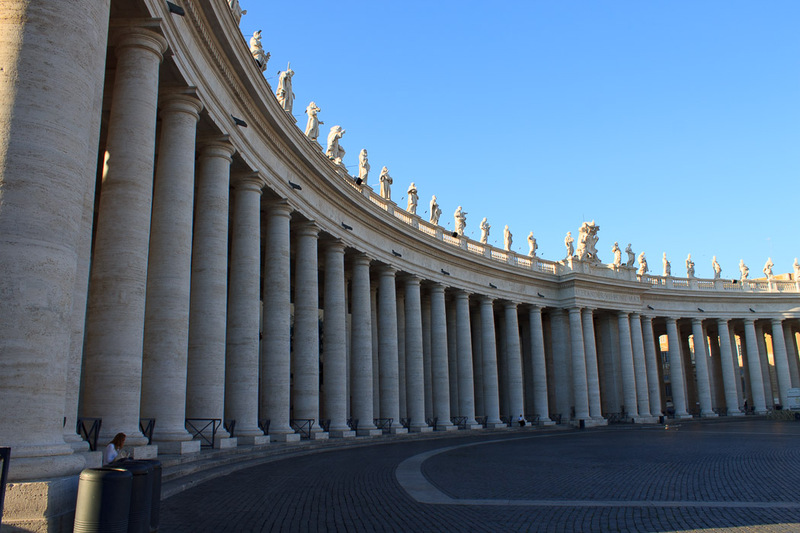 Two straight covered wings, each 400 feet long, connect the curved colonnades with the basilica's facade. On top of this whole structure are 140 12-foot tall travertine statues of Saints and Martyrs. On the western portion of the northern colonnade the statues are of the saints of the Early Church. The eastern range supports female saints and male founders of religious orders. On the southern colonnade higher ranking men can be seen on the western portion of the colonnade, while newer saints are seen on the eastern side. 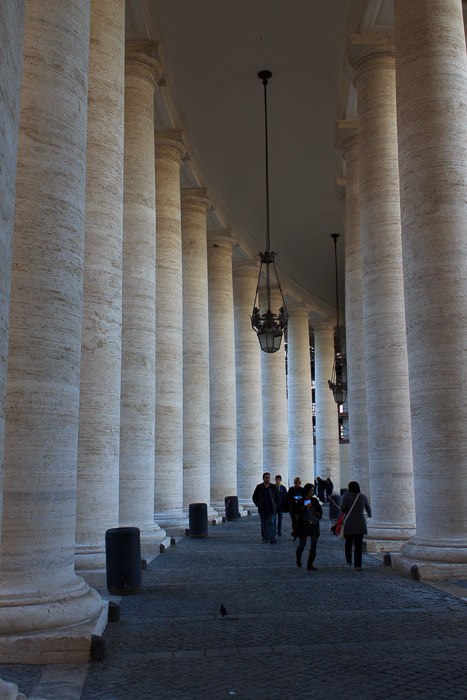 The curved colonnades symbolize the arms of the church welcoming everyone. 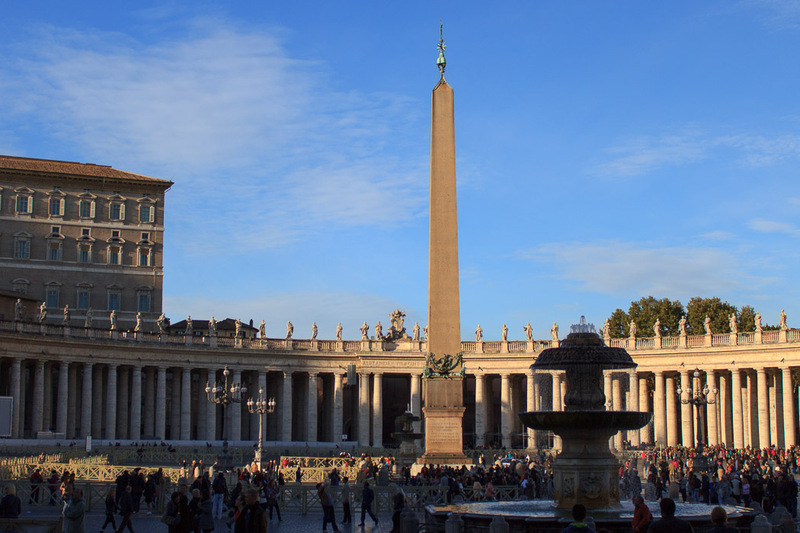 In the center of the oval part is the Vatican Obelisk, and on either side of the obelisk are fountains. 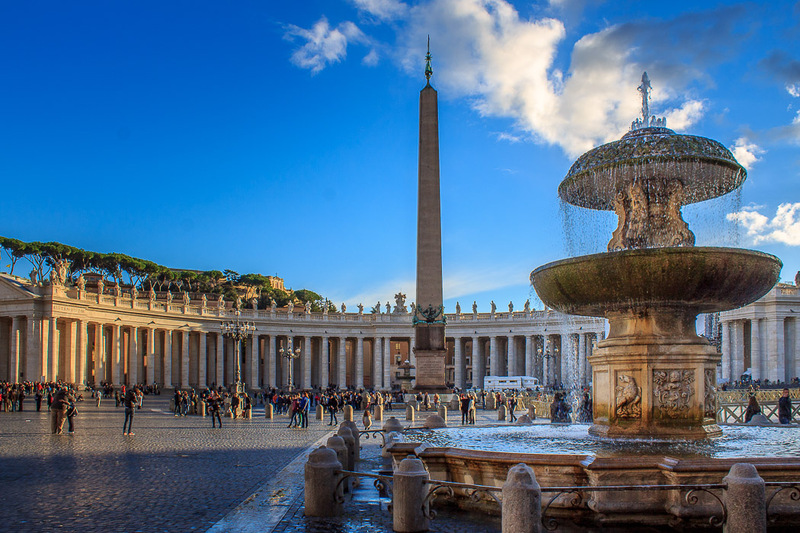 The northern fountain is called the Maderno Fountain and the southern fountain is called the Bernini Fountain. Between the obelisk and each fountain is a white marble disc with a granite center which marks the center of each curved colonnade. Stand on the disc and you'll only be able to see the first row of columns in the nearer colonnade. White marble discs on the northern side of the obelisk are used as sundial markers for the shadow cast by the top of the obelisk. Two dates are written on each disc to indicate when the noon shadow of the obelisk will reach this spot. 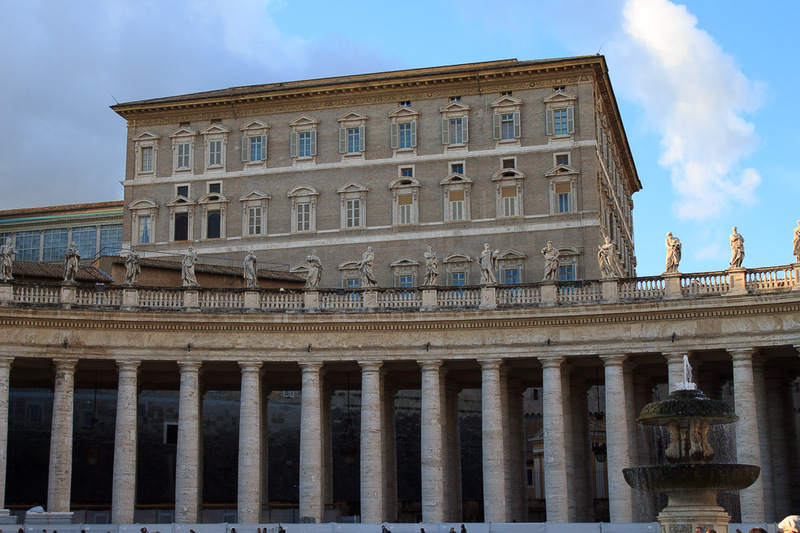 The papal apartment is behind the south colonnade (2nd photo below). As you approach St. Peter's Basilica from the front, you are greeted by two large statues. 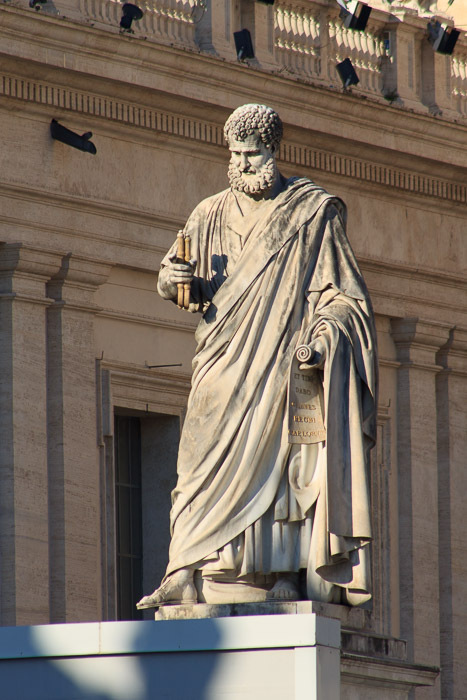 The statue of St. Peter, on the left side in front of the portico of St. Peter's Basilica, is shown in the 1st photo below. 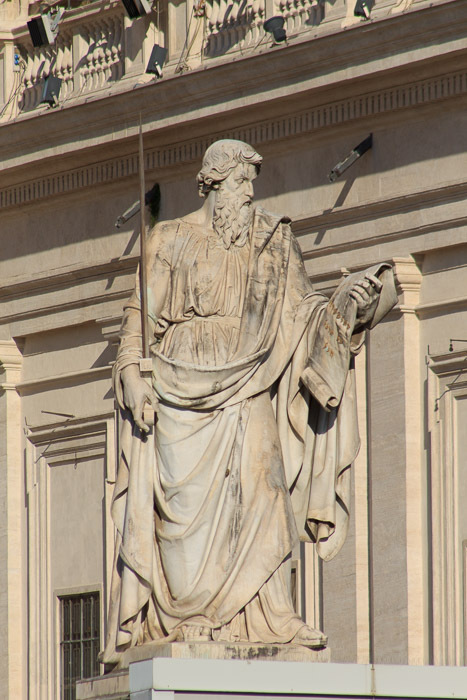 The statue of St. Paul, on the right side in front of the portico of St. Peter's Basilica, is shown in the 2nd photo below. See all St. Peter's Basilica photos. 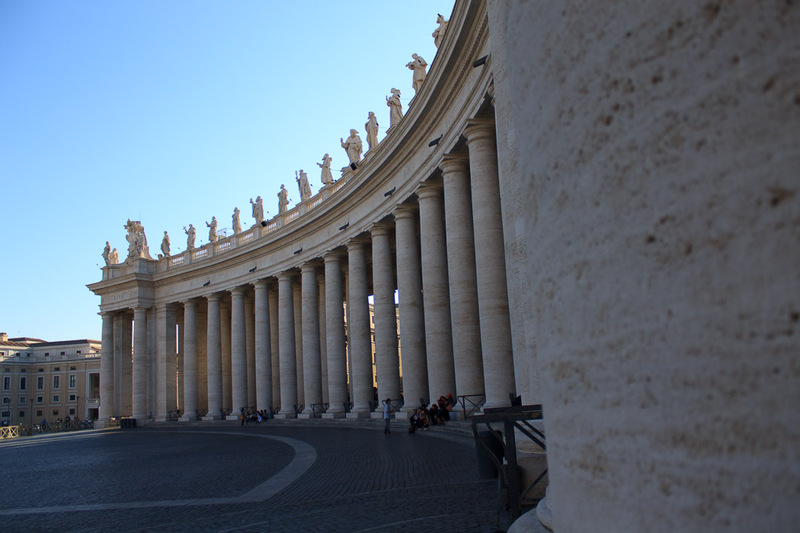 Below are a few more photos of St. Peter's Square.